With rain threatening today, I pocketed my Panasonic point-and-shoot instead of my digital SLR and accompanied my sister-in-law to the Milford Memories Festival. Thankfully, we remained dry during our walk through the downtown streets of Milford, Michigan, checking out nearly 1o0 artists’ displays and admiring the quaint neighborhoods and stores. While I missed my DSLR, in the end I was glad that I chose the small camera as I was able to shoot almost anything I wanted without undue notice. One vendor did take exception to a photo I took of his work, which was displayed on an antique screen with amazing detail and colors. I quickly complimented his iron work and explained how I liked the juxtaposition of the textures, but I don’t think he believed me. I quickly moved on. 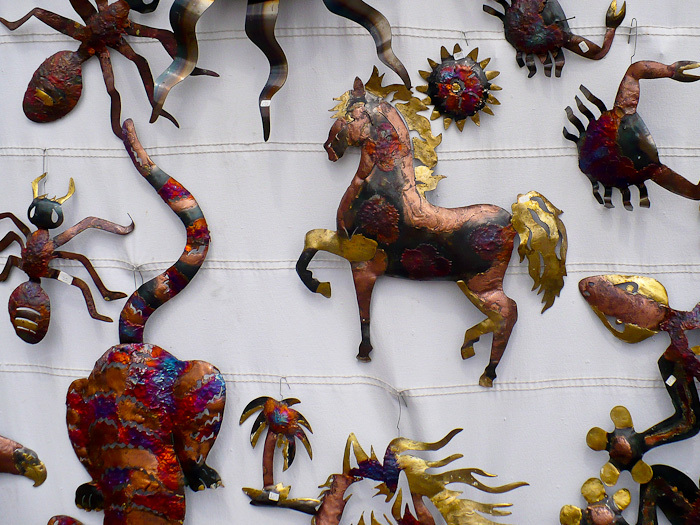 Shortly afterward, I found these gorgeous metal sculptures, and the vendor seemed more than happy to share them with an appreciative audience, camera or not. …..but his spider only has six legs! Liz and I make a habit of looking to see that critters are anatomically correct!!! LOL! Something I hadn’t considered but will no doubt check out from now on!